After putting in some hours working on a new header image and background image for both the web version and mobile version of Tumblr, I now have Flurry's Tumblr account up an running. Flurry has always had a Tumblr account, but I rarely ever updated it. It is now filled with character artwork and in the future I plan to put much more there. It should be easy now for Flurry's fans to share on Facebook or pin the great artwork on Pinterest. Enjoy! I'm pleased to say that all of my Flurry projects are moving along nicely. I should have some new surprises revealed in the next week or two. In addition to that, I now have a page named What Others Think and it contains news articles, letters, and reviews from others. It's a great place to check out if you are on the fence about taking a chance on a new novel series. If you want to know what others have experienced, this is the page for you. I also have many reviews from readers on Amazon.com, as well. I wanted to take a brief moment to point out that there is a horrible and cruel thing being done to moon bears. It is called bile farming. What is bile farming, you ask? It is when bears are kept in very small cages, barely larger than the bear itself. These small cages restrict the bear's movement and prevent them from standing up or moving around. While being kept in these tight cages, people harvest their bile. Bile is a digestive fluid produced by the liver and stored in the bear's gall bladder. The bears suffer tremendously in very harsh conditions. This is animal cruelty. Please help them. 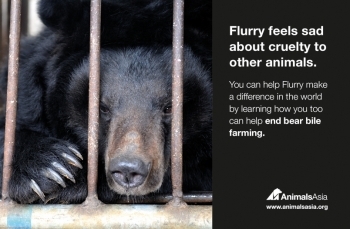 Flurry cries when he thinks about animals suffering needlessly. In addition to all of the updating underway here on the official website, I've decided to delete everything from Facebook and start fresh there as well. It's still a work in progress and I'm waiting on a very special image from one of my artists. In the meantime, I made some brand new character art just for Facebook. The art is meant to be a teaser to bring more traffic to Flurry's official site. There will be a lot more goodies to be seen here that won't be available on Flurry's Facebook. I'm excited about the future of Flurry and his adventures. There is a lot more coming and I'm building up to something amazing.